And there will be a significant Olympic angle to the World Mixed Doubles Championship as the event will decide which seven countries will compete alongside host South Korea at the 2018 Winter Olympics in Pyeongchang, where mixed doubles curling will make its debut as an Olympic medal sport. The newly crowned Canadian championship tandem of Joanne Courtney (Edmonton) and Reid Carruthers (Winnipeg), with national coach Jeff Stoughton, will open the 39-country competition Saturday at 11:15 a.m. (all times Mountain) against Turkey’s Dilsat Yildiz and Alican Karatas in their quest to lock up an Olympic berth for Canada. The combined results of the 2016 (at Karlstad, Sweden) and 2017 World Mixed Doubles Championship will determine the field for Pyeongchang. Last year, Canada’s Marliese Kasner and Dustin Kalthoff finished fifth, so a similar result or better will clinch Canada’s Olympic berth, although depending on other results, a top-eight result could do the same thing. 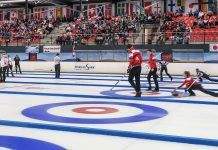 It will be the 10th edition of the World Mixed Doubles Championship, and Canada has managed to reach the medal podium just once in previous events — a bronze medal won by Ali Flaxey and Sean Grassie in 2009 at Cortina d’Ampezzo, Italy. Courtney will be looking to make history as a first double world champion in the same season; she also won gold playing second for Rachel Homan’s team at the 2017 CPT World Women’s Curling Championship, presented by Ford of Canada, last month in Beijing. For the first time, selected Canadian games at the 2017 World Mixed Doubles Championship will be broadcast by TSN, beginning with Canada’s game Wednesday at 11 a.m. against England’s sibling duo of Anna Fowler and Ben Fowler, who finished eighth last year in Karlstad. Three of the top four teams from last year’s event in Karlstad will be in Lethbridge, led by the Russian pair of Anastasia Bryzgalova and Aleksandr Krushelnitskiy, who defeated China’s Rui Wang and Dexin Ba for gold last year. Also returning are the fourth-place tandem of Gina Aitken and Bruce Mouat of Scotland. Other notable names in Lethbridge include a handful of players who were at the 2017 Ford World Men’s Championship, presented by Service Experts, earlier this month in Edmonton: China’s Ba; Matt Hamilton of the United States (who’s paired with his sister Becca; and Norway’s Magnus Nedregotten (playing with Kristin Moen Skaslien). Also, the Spanish team of Irantzu Garcia and Gontzal Garcia is being coached by reigning Alberta men’s champ Brendan Bottcher. The 39 teams are split into four pools of eight and one of seven. The top three teams in each pool will make the 16-team single-knockout playoffs, as will the fourth-place team with the best Draw-Shot Challenge (pre-game draw to the button) cumulative distance from the round robin. Round-robin play goes through Thursday, with the playoffs starting Friday. The gold- and bronze-medal games are scheduled for Saturday, April 29, at 4 p.m.
Games will be played in one of the two NHL-size arenas that are part of the new ATB Centre complex. Meanwhile, the 2017 World Senior Men’s and Women’s Championships will be staged at the 10-sheet Lethbridge Curling Club, which also opened its doors for play this season as part of the ATB Centre. It will be the fourth time the championships have been played in Canada, and there will be some very familiar faces wearing the Maple Leaf for Canada in the women’s competition. Six-time Scotties Tournament of Hearts and two-time world champion Colleen Jones of Halifax will make her world seniors debut, and will have longtime teammates Kim Kelly at third and Nancy Delahunt at lead. Mary Sue Radford will round out the Canadian team, which is seeking a leading 11th gold medal in the 16th edition of the World Seniors. On the men’s side, it will be an Ottawa team skipped by Bryan Cochrane calling the shots. Cochrane will be backed up by vice-skip Ian MacAulay, second Doug Johnston, lead Ken Sullivan and alternate Howard Rajala in pursuit of Canada’s leading 10th world senior men’s title. Both Canadian teams were decided at the 2016 Everest Canadian Seniors in Digby, N.S. There will be 15 women’s teams (split into a pool of eight and a pool of seven) and 23 men’s teams (split into two pools of eight and one of seven) competing in Lethbridge, with round-robin play kicking off on Sunday. Canada’s women’s team plays its opener Sunday at 12:15 p.m. against Italy’s Fiona Simpson, while Cochrane’s Canadian men see their first action Sunday at 4:30 p.m. against England’s Thomas Campbell. Round-robin play wraps up on Thursday, with the single-knockout playoffs getting underway Thursday evening. The men’s and women’s gold- and bronze-medal games are Saturday, April 29, at 2 p.m. Both reigning world senior champions are in the field in Lethbridge. At the 2016 World Seniors in Karlstad, home-country favourite Mats Wranå beat Canada’s Randy Neufeld in the gold-medal game. On the women’s side, former world women’s champ Jackie Lockhart of Scotland, who won senior women’s gold last year in Karlstad, will take aim at back-to-back gold. Canada’s Terri Loblaw was knocked out in the quarter-finals last year.